One of the best parts of my job is that I get to work with some of the funniest, nicest, smartest, most food-passionate/knowledgeable people on the planet. Number one in all of these categories is the inimitable Steve Siegelman, who helps me organize my thinking about the broader project, and then zooms into the micro with his brilliant sense of language. A huge thank-you to Steve for his comprehensive support—in every sense. Christi Swett is my recipe test accomplice, and Lorraine Battle, my food styling partner. Could I do it without you? Maybe. But it wouldn’t be nearly as good, and it definitely would be a whole lot less fun. Major thanks to Beth Shepard for being here for me, always—for the big, medium-sized, and little pictures, all of them important and insistent. To Janet M. Evans, graphic designer extraordinaire: I have loved sitting with you at the computer for umpteen hours, and I am thrilled with the results. You are a true example of artistic talent minus the temperament! There should be more of you in the world, but for now, I’ll settle for just one. And thanks to Philip Rolph Scanlon for feeding us. To my wonderful mother, Betty Katzen: Thank you for everything-in-general, and for your brisket recipe in particular. To my children, Sam Black and Eve Shames: Thank you for your inspiration and advice, and for your great taste in food (and in everything else). And thanks to my terrifically helpful, unofficial focus group for your great input: Steve Troha, Sarah Goodin, David Havelick, Becca Hunt, Laura Mead, and Cooper Reaves. To Ted Mayer and everyone at Harvard University Dining Services, and to all the many incredible Harvard students who have so generously shared meals, stories, and helpful feedback over the past number of years: Much appreciation for the honor of collaboration and friendship. Thanks to Ken Swezey for providing consistently excellent pragmatic support; to Will Schwalbe for your generosity of spirit and your dead-on sense of context; and to Robert MacKimmie for being my garden-and-photo guru and champion. Bob Miller is a publishing visionary, and a one-man cheerleading squad who has helped me stay buoyant throughout the past more than a dozen years. Big thanks to Bob, and to the gang at HarperStudio: Debbie Stier, Sarah Burningham, Julia Cheiffetz, Katie Salisbury, Kim Lewis, Nikki Cutler, Lorie Young, Leah Carlson-Stanisic, Doug Jones, and Mary Schuck (cover maven). You’re the best! Much appreciation to Kathie Ness, who is a most “respectfully submitted” copy editor, and to Elizabeth Parson for building the index. Special thanks to Lara Gish and the Kashi Company for their support of get-cooking.com, and for their impressive work in making healthy products taste singularly delicious. However you do it, please keep it up. and we all know what we like. But for many people—sadly, frustratingly—the love of food doesn’t necessarily translate into happy, good eating on a daily (or even weekly or monthly or any kind of regular) basis. Somehow, as our options have increased—from restaurants and takeout to more and more frozen heat-and-eat options of every kind—the fine, ancient craft of cooking has become something of a lost art. Why it that? What bridge is out? I truly believe the missing link is pure knowledge: learning how to cook—for real—and then falling in love with it so much that we find ourselves making the time for it. Over and over. And then it becomes part of our lives. sandwich. But that’s not what I’m talking about. I mean, I wonder how many people are munching junk food (or just plain not-very-good food) while watching gourmet cooking on a screen. We’ve kind of become a nation of nutrient-and flavor-challenged food voyeurs. Let’s change that. I’m here to help. For starters, I’m exceedingly happy to present you with 150 delicious, doable recipes that even the most inexperienced person can walk into any kitchen right now and make for dinner tonight. The “cuisine” is what I like to call “Big Tent,” accommodating a broad base of tastes and needs, vegetarian and meat-loving and everything in between. I’m talking about soup-from-scratch, pastas that are light and well seasoned, salads you can make quickly and well, classic meat dishes with vegetable and potato sides to round them out, and plenty of vegetarian recipes (many of them vegan) that will please just about everyone. You’ll find this food to be boldly seasoned—there’s absolutely no need for “beginning” to mean “bland”—with lots of ethnic influences and flavors to keep things interesting. These recipes are written in a way that I hope you can grasp in a single read-through, with a list of ingredients that isn’t overwhelming and step-by-step instructions that really walk you through the process. The key phrase is “read-through,” which I hope you’ll take literally, as a thorough grasp of the tasks at hand will make all the difference between driving the boat and drifting around at sea. I want to stand beside you (in spirit and in information, if not in person) as you cook, letting you know what to expect and what things should look like as your meal goes from idea to reality. Along with the recipes, I have also included many handy skills for learning how to cook the food you love in your own (possibly first) kitchen—in your own way and often. I hope these recipes and advice will give you both the knowledge and the confidence to find the link between your appreciation of food and your ability to prepare it with your own two hands. Joy and pleasure and fun (and a newborn sense of accomplishment) can be yours all along the learning curve. Does this sound familiar? You find yourself eating pizza or fast food more nights a week than you wish. Higher-end takeout is an occasional option, but it’s expensive. You regularly crave a home-cooked meal at the end of the day instead of that slab of pizza. You’d really rather be eating a healthier, tastier, and more balanced diet. You’re curious about flavor combinations and interesting cuisines (ethnic and otherwise), and you’d like to experiment. You’d also like to know what the heck you’re doing in the process. And most of all, you’d like to have what you really enjoy, rather than settling for someone else’s idea of what’s good. You’d like to think of yourself (and have your friends and family think of you) as someone who knows how to cook. You’d like to share the pleasure of food and drink with your friends, without spending a ton of money at a restaurant. You fantasize about everyone getting together to shop, cook, eat, and hang out till all hours at your place without using up your entire month’s entertainment budget in a single evening. But you’re not sure where to begin. You leaf through cookbooks, surf the web, pick up a food magazine at the grocery store—and end up reading it in bed rather than cooking from it (or not reading it at all because it’s too slick, and you’re sure it’s been written for someone else).
. Not someday, not when you move into that place with the nice kitchen. Tonight. And thereafter. 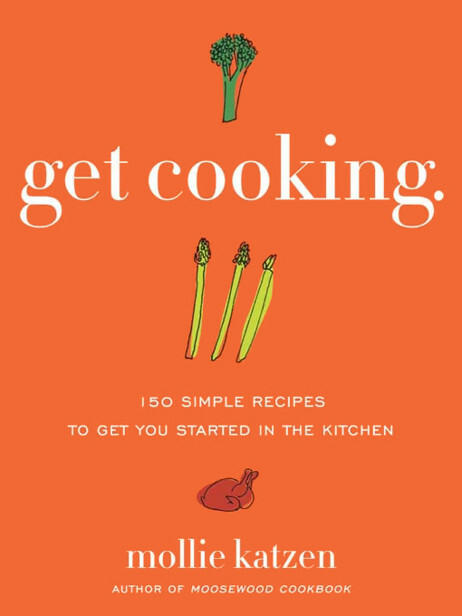 This book, and its companion website, get-cooking.com, are going to give you plenty of the first two things—the recipes and the advice. The desire and the confidence, of course, are going to come from you. But trust me, the more you cook, the more that will happen on its own. Learning to cook real food for yourself and the people you love is life-transforming. You’ll gain skills you can rely on forever. You’ll discover a whole new way to be creative, healthy, and focused, as well as popular. And who knows? Cooking might just become your favorite hobby—replete with benefits. cooking in a whole new way. read—each recipe well, visualizing everything as you do so. And don’t do this as you’re rolling up your sleeves to get started, but much earlier, at the point when you’re deciding what to make and laying out a game plan. Studying the recipe will give you a sense of what ingredients you need to buy, whether you have all the right equipment, and how long the whole process will take. In these recipes, I’ve given you a heads-up each time something needs to be done in advance (especially when there is a waiting period for something to cool down, chill, or warm up to room temperature). Take the time to familiarize yourself with a recipe before you start, and you’ll be cooking from the driver’s seat instead of by the seat of your pants. I strongly recommend that you get all the ingredients for each recipe completely prepped and ready before you start the actual cooking. Lay everything out (having a lot of containers helps) in an organized fashion near the stove. Get your tools handy, too. In most recipes I’ve been pretty specific about the best tools to use, so again, if you read through first, you’ll find embedded set-up information. The better set up you are, the more fun you’re going to have once you turn on the stove. There’s another really important streamlining habit I strongly encourage you to develop: Try to clean up as you go. This is especially helpful if your kitchen is small. After you’re done prepping the ingredients and you have them all lined up in their respective containers by the stove, clean the knife and cutting board, and put away anything you’re finished using. Wipe down the counters, wash your hands, and take a deep breath. Now, proceed to the cooking phase. -cleanup awaiting you at the other end? Try to minimize it by keeping a tub of warm, soapy water in the sink. As soon as you’re done with a dish or a utensil, just clear it of debris (compost bin, anyone?) and slip it into the tub. The exception is sharp knives, which should be kept separate so you won’t accidentally slice your hand under the suds. Rinse the stuff later; just get it soaking for now. It will make a big difference. garage sales and thrift shops. And let all your relatives and friends know that you are in the exciting process of setting up a serious(ly fun) kitchen, so that they will keep you at the top of their hand-me-down list whenever they upgrade. Remind them, also, of your birthday, and promise to invite them often for dinner. That should help. Here’s a starter list that should pretty much get you through every recipe in this book. to scrimp, so visit a cookware store and get some advice. You will also want a sharp paring knife (also straight-bladed, not serrated), which is way smaller than the chef’s knife and thus invaluable for cutting diminutive things (like shallots) or doing fine work (like peeling and seeding fruit and vegetables). High-quality knives will last you a lifetime if you maintain them properly. To that end, you’ll want to invest in a knife-honing steel. This is a long rod with a handle. Here again, get advice at the cookware store, and ask for a demonstration. Use the steel to hone your knife frequently, and if you notice that the blade is getting dull and the steel isn’t helping, take your knives to a professional sharpener. It’s a good idea to do this once or twice a year, depending on how much of a workout your knives get. A long-bladed serrated bread knife is good to have for slicing bread. A high-quality bread knife will stay sharp for years. It can’t be honed on a steel, but you can have it sharpened professionally. And speaking of serrated knives, you might also want to have a smaller one on hand for cutting citrus and tomatoes. Buy a few wood or plastic cutting boards—you can’t have too many, and they take up very little space. I recommend having a dedicated one for onions, garlic, and shallots, as these flavors are difficult to get rid of and tend to keep imparting themselves to other things that get cut on the board long after the fact. That’s okay for vegetables, but really frustrating when your fruit salad is inadvertently seasoned with a hint of garlic. You should also have a separate plastic board for raw meat, poultry, and seafood to avoid cross-contamination with other foods. Make sure you clean it with soap and hot water—and thoroughly dry it—after each use. you will often start a recipe on the stovetop, and then cover the pot and put it in the oven. Since you’ll often be browning things in this pot as a first step, it’s essential that it have a heavy bottom. (A thin metal pot will scorch food rather than browning it evenly.) Look for a substantial pot, such as one made of enameled cast iron, and treat it with respect, using wooden utensils to avoid scratching its surface. A 10-or 12-inch skillet is likely to be one of the most used pieces of equipment in your kitchen, so here again buying a good one matters. That doesn’t mean it needs to be expensive. A cast-iron skillet will work well. If your skillet comes with a lid, all the better. If it doesn’t, look for a heavy lid that will fit it (garage sales and thrift stores are sure to have a selection). A 6-to 8-inch skillet is handy for cooking eggs and small amounts of food. It’s good to have both sizes. You will need a medium-sized (around 2-quart) saucepan with a tight-fitting lid and a heavy bottom, a 9-by 13-inch baking pan (metal or glass), and a few good, heavy baking trays. This is a small, round, corrugated metal insulation pad, also known as a Flame Tamer or heat diffuser, that you can put under a pot on the burner. It allows your lowest setting on the stove to become even lower for long simmering of foods, like rice and soup, that you want to cook through very slowly without burning them on the bottom. Keep these near the stove, in a drawer or hanging from a hook—and make sure they stay dry. If they get wet, they’ll conduct heat and this will painfully (to you) defeat their purpose. Collect various sizes from large to small—and various shapes (deep and shallow) for marinating, tossing, beating, combining, and serving. Nesting sets are nice for space-saving. And in general, when it comes to bowls, between holding ingredients, mixing, and serving, you can’t have too many. Your colander should be large enough to drain a batch of pasta. You might also want to have a smaller one for washing and draining small amounts of vegetables, fruit, herbs, or other ingredients—or use a strainer for this purpose. A medium-mesh strainer is useful for everything from sifting powdered sugar over foods to draining and rinsing a can of beans. all the time. It’s handy to keep them in a pitcher or vase by the stove for easy grabbing. Keep some whisks, tongs, and other frequently used items in there as well. They’re cheap, so get a few of various dimensions. Invest in heatproof ones, which cost a bit more but won’t melt into your scrambled eggs. This tool is indispensable for when you want to loosen and then flip a burger or other skillet food and don’t want to leave any of the crisp parts in the pan. Get yourself a set of whisks—small, medium, and large—and you’ll be able to handle anything from whipping cream to whipping up a salad dressing. Spring-loaded tongs that you can use with one hand are indispensable. Watch any professional cook in action, and you’ll see why. Buy a pair to use just for food and keep them in your kitchen drawer. You will be surprised at how much these will get used—from snipping chives and other herbs to cutting fish and poultry. Like your knives, your kitchen scissors will last longer and perform better if you have them professionally sharpened from time to time. Get a 4-to 6-ounce ladle for soups and stews and for ladling pasta water from the pot into a sauce. When you see a recipe that calls for minced garlic in this book, you can either mince it with a knife or press it through a garlic press, which saves time. A good, heavy-duty box grater is indispensable for grating everything from vegetables and potatoes to cheese. These ultrasharp graters, sold in cookware stores, are fabulous for fine-grating citrus zest and ginger, hard cheeses like Parmesan, and chocolate (for sprinkling on desserts or drinks as a garnish). Useful for spreading olive oil on baking trays or brushing food with oil or melted butter. Look for a good, sturdy one, either Y-shaped or straight. A cheap, flimsy peeler will slow you down and won’t do as thorough a job. If you will be cooking meat or chicken, this is your “when is it done?” insurance policy (see Chapter 6: Chicken, Fish, and Meat). Treat yourself to a nice, heavy-duty set. Actually, treat yourself to two. I find that having two sets really helps when you are measuring both dry and wet ingredients in one go-round and you want to keep them separate. These are used to measure dry ingredients, such as flour, and have flat edges, so that you can fill them and then scrape the excess off with the back of a knife blade. This gives you a more accurate measure for dry ingredients than a liquid measuring cup (see below). These are usually made of glass with measurement lines on the side. Get two heatproof glass ones with spouts for pouring—one 2-cup and one 4-cup capacity. These can be used both for measuring and for heating/melting ingredients (like milk or butter) in the microwave. Collect food containers with tight-fitting lids in various sizes (store them stacked, with covers in a shoebox on the side). This is better for the environment than using plastic bags and plastic wrap. Also, save those plastic tubs with tight-fitting lids—the ones left over from when you binged on a bulk cookie purchase at the club store. They’re great for storing grains, beans, nuts, and dried fruit, and they stack well for space-saving. Wash and save jars. Small ones are great for storing all your brilliant homemade salad dressings. Larger ones are perfect for keeping dried fruit and nuts, or beans, lentils, and grains. If the ones you brought home from the produce section or the farmers’ market are clean and dry, keep them for further use. Clean them out when the coffee is gone, and use them to store those plastic bags you saved. Keep a few around for labeling whatever you are storing, with both the item name and the date. You might think this is overkill, but you will later thank yourself for doing this, I promise. These take turns being indispensable. These are great for storing small bags of spices bought in bulk (which reminds me to recommend that you look for specialty food stores that sell spices in bulk, by the ounce, which will save you lots of money over time). additions to the recipes. Note that these are “special” and not “essential.” Here’s some useful information about them, so you can stock up to the degree that your wallet allows. But first, before we get to the fun part, a few words about oil. throughout this book. Your standard, everyday workhorse oils will, in most cases, be olive oil (choose a not-too-expensive extra-virgin) plus a second, more neutral-tasting oil, to use when olive flavor is incompatible with the dish. For this second oil, I recommend canola, soy, or peanut oil. Occasionally, but not often, I will also include some butter (which vegans can simply omit). So these are your daily heavy lifters. Onward to the flavoring ones. There are many, many imported and domestic olive oils on the market these days, ranging from “pure” to “extra-virgin.” As I mentioned above, I recommend using a not-too-expensive extra-virgin for everyday cooking and salad dressings, and keeping an extra-extra special one around for special-occasion finishing and drizzling (recommended throughout the book). A small drizzle can have a large and good effect, so you can use this economically. This dark Chinese flavoring oil is sold in the Asian foods section of supermarkets. All I want to say is “please get some”—it’s that good, and that important an ingredient. These profoundly flavorful seasoning oils (which include walnut, almond, hazelnut, pistachio, and pumpkin seed oils) are not for cooking, but rather for drizzling onto your cooked food as a “flavor finish” or to supplement the olive oil in salad dressings. You can also use them as a dunk for fresh bread to create an exquisite appetizer, soup accompaniment, or quick snack. Keep all oils stored in a cool, dark place—or in the refrigerator. This is especially true for the “gourmet” ones, so they will stay good over the period of time you are parceling them out. No imitations, now or ever, or you will go to culinary jail. Actually, I’m only somewhat kidding. If you love maple syrup impersonators on your pancakes, I won’t tell you to stop using them there. But please don’t cook or bake with them. Store these in your cupboard (they keep indefinitely): cider vinegar; a decent, moderately priced balsamic; red wine vinegar; seasoned rice vinegar (make sure the label says “seasoned”). From there, you can experiment with fancier varieties, such as sherry, raspberry, and so on. This sweet-tart-tangy syrup made from reduced pomegranate juice is available at Middle Eastern food shops and in the imported foods section of many grocery stores. It keeps forever in your cupboard, and a little bit goes a long way, adding flavor and bright color to Middle Eastern dishes and all kinds of other foods, from salads and grilled chicken to yogurt and cheese. Keep a supply of dried apricots, prunes, figs, dates, cherries, cranberries, and blueberries (as well as other, more exotic dried fruit, such as pears, papayas, and chili-dusted mango) on hand to liven up salads, grains, entrées, and desserts. gray salt, black salt, and pink salt, tend to have a coarse, crunchy texture, which makes them a good choice for “finishing”—that is, sprinkling on dishes like salads or vegetables at the very last minute, so their texture and intense hit of saltiness stand out. Then there are flavor-infused options, like smoked salts and truffle salts. And of course, there’s only one way to know which of any of these you’ll like: buy a few and start experimenting. Most cooking involves an initial preparation phase, in which you cut stuff up. Check out the prep videos at get-cooking.com for quick lessons in the best way to handle most vegetables. And in the meantime, on Get Cooking is a quick reference guide to basic prep techniques you’ll be using to make the recipes in this book. As you become increasingly comfortable and adept at chopping, cooking will feel more and more fluid, like a dance. (Go ahead and put on some music!) Be sure to use a very sharp knife (see Get Cooking), go slow, and pay careful attention while you work. (Don’t try to motor your way through at the speed of light, as some of the cool chefs seem to do on TV. Please!) Always maneuver whatever item you are cutting into the most stable position on the cutting board (for example, flat side down after an initial cut—or just plain hold it very steady with your noncutting hand), in order to keep things safe. (An escaping morsel can lead to your slicing your hand instead!) For vegetables not covered in this guide, use the same principles as those on the following pages. This process will become familiar to you soon enough. Have fun! If you want to master the art of making a good home-cooked meal for yourself and the people in your life, soup is a perfect place to start. Soup fills your home with the welcoming smell of good things simmering, and in most cases it practically cooks itself, once you do a bit of initial ingredient prep. Why not just open a can? Well, when you’re pressed for time, there’s nothing wrong with that. But a little time making soup from scratch is a great investment that beats canned soup hands down. It’s tastier because you’re in control of the ingredients and the seasonings, and you can choose what’s fresh and in season for the raw materials. It’s cheaper, especially when you consider that a big pot of soup can last for several meals or feed a crowd. It generally freezes and reheats well. And, best of all, it’s something wonderful you can take pride in having created—often from next to nothing. Soup is, generally speaking, ingredients simmered with water or broth—sometimes puréed, sometimes not—served hot (or sometimes cold). It’s about that simple. So, if you have a large heavy pot, a ladle, and something to purée with, even the tiniest apartment can be home to a great soup kitchen. There’s no single way to make soup, and some recipes involve a little more advance preparation than others. That’s why it’s important to read through any recipe in this chapter (and really, any recipe at all) before you start cooking—and especially before you decide to make it for the first time. That way, you’ll be able to gauge the timing, check what ingredients you need, and decide if this is one for tonight or something to try next weekend. Many soups are made by cooking ingredients like potatoes or vegetables in broth or water until they’re soft, and then puréeing them to achieve a thick, smooth consistency. A regular stand blender works well for the purpose, but an immersion blender is even better. Whichever way you go, before you purée any soup, let it cool down a bit so you don’t get burned if any accidentally spills or splashes. and drape it over the lid (another very helpful safety measure to keep hot soup from splattering you). Put one hand on the towel and hold the lid down firmly before you turn on the motor. With the other hand, turn the blender on, setting it to its lowest speed (cranking it to “high” right away will probably pop the lid). Then increase the speed gradually to the highest setting. Because you’re puréeing in batches, you’ll need a large container, bowl, or a second soup pot to hold the blended soup as you work. When you’re done, pour everything back into the original cooking pot to reheat the soup; or for cold soups or ones you’re making in advance, let the soup cool in the container and then cover it and chill it in the refrigerator. Immersion blenders (also known as stick blenders) are among a handful of game-changing kitchen tools. So if you’re liking the idea of making soup a more regular part of your life, I highly recommend you rush out and buy one. They’re not that expensive, and they have several advantages over a conventional blender: There’s no second bowl or pot to dirty up, because the puréeing happens right in the soup pot. They’re easy and fast to use, because you don’t have to work in batches. They allow you to see just how puréed everything is getting, so you can stop the minute you’ve achieved the texture you want. And they’re easy to clean and don’t take up much space. Convinced? To use an immersion blender, take the pot off the stove and set it somewhere stable. Submerge the business end of the immersion blender completely into the soup, holding it straight up with the base flat against the bottom of the pot. To avoid splattering and over-blending, turn on the motor to the lowest setting and then gradually increase the speed. Then simply move the blender around, always keeping the base flush with the bottom of the pot and the blade submerged. You can use a food processor fitted with the steel blade attachment to purée some soups, but for very liquidy ones it really doesn’t do as good a job as a blender or immersion blender. If you do use one, work in batches and avoid filling the bowl of the processor more than two-thirds full. Yes, the lowest-tech option of all works quite nicely when you want a somewhat puréed but still fairly chunky texture. Just mash (gently, to avoid splashing) until you like what you see. When a soup calls for stock or broth, I recommend using the kind that comes in boxes because it tastes much better than canned. Look for a good organic brand. They’re all quite different, so shop around until you find one you like. For those emergencies when you run out of broth, keep some bouillon cubes on hand. To store soup, let it cool, transfer it to an airtight container, and put it in the refrigerator. Stored in this way, most soups will keep for 3 to 4 days. Most soups also freeze well. A handy way to do this is to let the soup cool and then put individual portions in resealable plastic freezer bags. That way you can put one in the refrigerator to thaw in the morning (never thaw soup, or anything, at room temperature—it’s not safe, bacteriologically speaking) and it will be ready to heat up when you come home from work. Press most of the air out of each bag and lay it flat in the freezer until it has frozen solid. You can also freeze soup in plastic containers with airtight lids. Liquids expand when they freeze, so leave about half an inch of space at the top. Always label bags or containers with the kind of soup and the date (permanent markers work best). If a soup has lived in your freezer for more than 6 months, throw it out. Soups that tend to be freezer-challenged are those made with dairy, eggs, and/or lots of puréed potatoes. Freezing tends to make them break apart and take on a mealy or watery consistency. So don’t freeze these. The aesthetic and psychological impact of a simple garnish can’t be overstated. Set aside some of the herbs used in making a soup to top each serving. Or add a dollop of sour cream, yogurt, crème fraîche, or salsa, or a drizzle of good olive oil. Grated Parmesan or crumbled feta or goat cheese works well with many soups. And for crunch, sprinkle a few croutons or crumbled tortilla chips on top. Soup can definitely be a one-bowl meal. But depending on your appetite and your mood, you might want to add a little something to round out the menu. Match the dressing to the style of the soup. I’ve given you some recommendations with the recipes (kind of like wine-and-food pairings, except it’s soup-and-salad pairings), and you can take it from there. For a filling, nutritious, and inexpensive dinner, simply ladle some soup over a bowl of cooked rice. Drizzle with olive oil, feta, olives, and herbs. Warm or toast a few slices of crusty bread or cornbread—store-bought or homemade (see Chapter 4: Vegetarian Entrées). Adjust the oven rack to the center position (if using a full-size oven) and preheat the oven (or toaster oven) to 375°F. Line a small baking pan with foil. When cool enough to handle, break each bulb into individual cloves and squeeze the pulp onto a plate. Use a fork to mash the garlic, gradually adding the remaining olive oil as you mash. Use right away, or refrigerate or freeze with a little olive oil until use. anned chicken noodle soup is about to become a thing of your past. This straightforward version is all about making (and keeping) it real: big chunks of chicken, wide noodles, plenty of carrots and celery. For the broth, go for the kind sold in boxes, and choose a good-quality brand, preferably organic. To make this soup even easier, you can replace the chicken breasts with some leftover rotisserie chicken or other cooked chicken meat. Just shred enough to make about 2 cups and add it to the soup along with the noodles. Place a soup pot or a Dutch oven over medium heat. After about a minute, add the olive oil and swirl to coat the pan. Add the onion and salt, and cook, stirring occasionally, for about 5 minutes, or until the onion softens. Add the carrots and celery and continue cooking, stirring occasionally, for another 5 minutes. Pour in the broth and bring to a boil. Add the chicken breasts and turn the heat all the way down to the lowest possible setting. Cover and simmer gently for 8 to 10 minutes, or until the chicken is no longer pink in the center. (You can check by cutting into the meat with a sharp knife.) Use a slotted spoon or tongs to remove the chicken from the broth. Put it on a plate and let it rest for about 5 minutes, or until it is cool enough to handle comfortably. Meanwhile, using a large spoon, skim off and discard any foamy residue that might have shown up on the surface of the soup. Bring the soup back to a gentle boil over high heat, and add the noodles, stirring to keep them from sticking together. Cook for 5 to 8 minutes, or until the noodles are tender. While the noodles are cooking, shred the chicken (use two forks, a small knife, or your fingers) into bite-sized pieces. When the noodles are tender, add the shredded chicken to the soup and season to taste with a few grinds of black pepper. Serve hot, topped with a sprinkling of parsley. For a nostalgia-laced simple dinner, pair this soup with a green salad dressed with Homemade Ranch Dressing (Chapter 2: Salads), and garnish the salad with very sweet cherry tomatoes. Squeeze some fresh lime juice into the soup just before serving, or serve with wedges of lime on the side for people to add at the table. To take the soup in a Latin direction, in addition to adding lime juice, you can garnish each serving with chopped cilantro plus some crispy tortilla strips (or crumbled tortilla chips) and a dollop of your favorite salsa. Love matzo ball soup? Buy a package of matzo meal, follow the directions for making matzo balls (you can even make them a day or two ahead of time), and add them to the soup instead of the noodles.